Landmark partnership for Cloud-based analytics! IBM and Twitter! A partnership has just been announced between IBM and Twitter! This alliance brings together Twitter data together with IBM cloud-based analytics, customer engagement platforms, and consulting services. The collaboration will focus on IBM analytics services on the cloud, a new set of applications providing data-intensive capabilities for the enterprise, and specialized enterprise consulting. Entrepreneurs and software developers will also be able to integrate Twitter data into new cloud services they are building with IBM’s Watson Developer Cloud or IBM Bluemix platform-as-a-service. 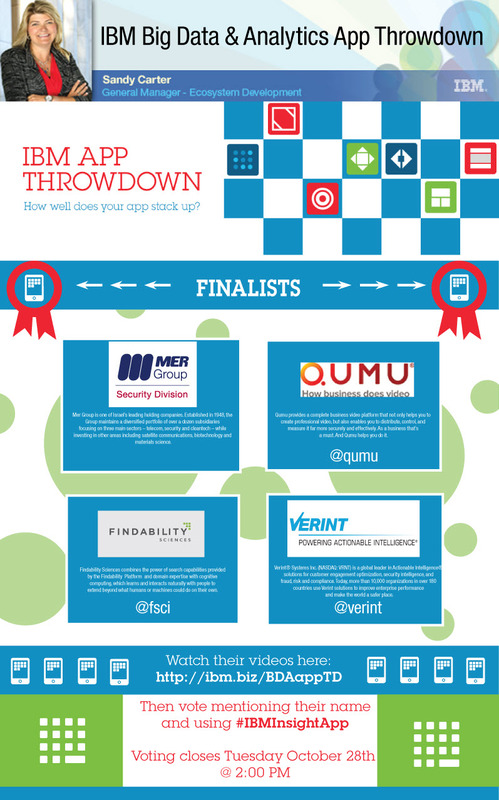 IBM BIg Data and Analytics App Throwdown! 3 great European Entrepreneurs improving lives with mobile, 3D printing and retail in the cloud! SmartCamp season is in full swing in Europe this month, and I’ve got some great news I want to share with you! Let’s start in Warsaw, Poland! Have you ever considered how convenient it would be to create a mobile app in under 24 hours? Kinetise has, and that’s why they won the IBM SmartCamp Warsaw event! Kinetise is a SaaS solution for rapid and easy creation of mobile applications for small business, a great fit for IBM MobileFirst! Even the most complex and advanced applications can be built with Kinetise because their development engine supports a wide variety of functionality, including design freedom, 2-way communication with external servers, user authentication, and integration with various popular APIs. Follow them @Kinetise. Tiramizoo won the SmartCamp Berlin event with their same-day delivery cloud solution! The Watson Ecosystem Expansion on Bluemix and in multi Industries! We (IBM) announced 7 new Watson API services available on BlueMix, enabling developers to use a wide variety of Watson capabilities. The first wave of Watson-powered apps is debuting in industries such as travel, retail, healthcare, and more. One example is a new company launched by Terry Jones, founder of Travelocity and Kayak.com, aimed at reinventing the travel experience with Watson. IBM Champions Entrepreneurs in NYC! Introducing Digital.NYC!!! !